Teachers need to allocate storage space for the wind turbines during construction. Educators will want to provide additional content about the science of wind energy as a source of renewable energy, including energy storage, transmission, etc. Activities like this have been used in energy, weather, and environmental science units as well as in physics classrooms to teach aerodynamics. Models the scientific process - especially hypothesis testing. The testing of actual blade models will reinforce the importance of blade design. With additional scaffolding, it can be used in energy, weather, and environmental science units or to teach students how to properly set up and use the scientific process while exploring something new and different. Technology teachers could use this lesson to teach about the design process and integrate science concepts. The activity could also be used as a small segment in a month-long exploration of wind energy (it would require more scaffolding to do this effectively). Great teaching materials with good handouts. Substantial preparation time required to implement activity. 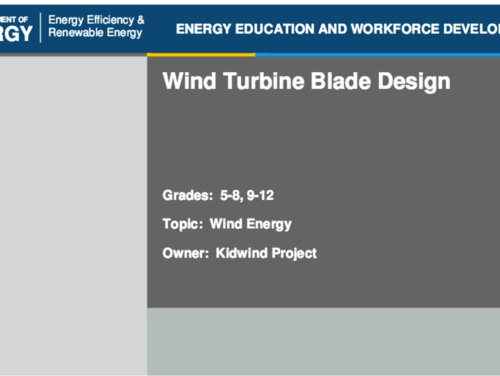 Educator must be familiar with wind turbine models and should experiment with one before attempting to do this project. Educator needs to provide specific instructions to standardize turbine testing. The resource is built around the background materials and kits available for sale at http://www.kidwind.org, however materials can be purchased elsewhere. Instead use http://www.windpower.org/en/] for Danish Wind Association site and [http://www.awea.org/ for American Wind Energy Association site.